How to play ukulele chords! Have you heard that ukulele is one of the easiest string instruments to play? Learn all the main ukulele chords and finger positions with 120 Ukulele Chords, an app that offers you ukulele frets, notes and finger positions! 120 Ukulele Chords is suitable both for beginners and advanced ukulele players. You can explore ukulele chords, create your own note charts and ukulele chord sequences for your favorite songs or for your ukulele practice sessions. Are you left-handed or right -handed? Either way, we got you covered. 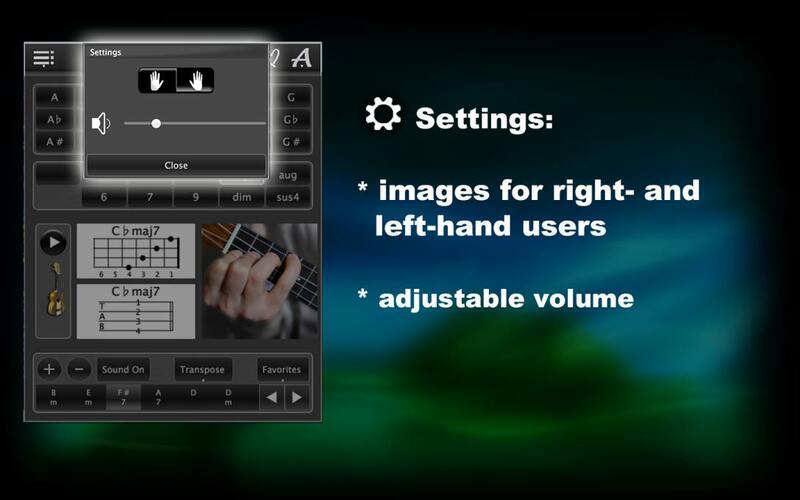 Just let the app know your preference in Settings and enjoy all the features of this ukulele learning software. 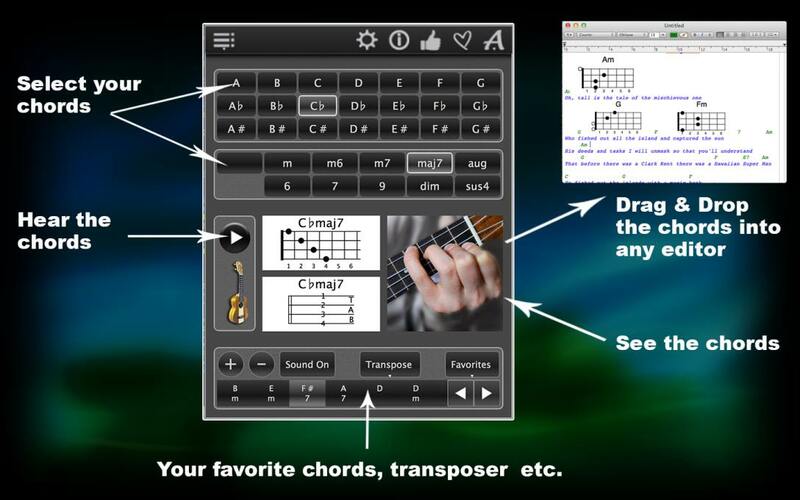 Select the key and the chord type of a ukulele chord, and the app will show you this chord as ukulele frets, notes and as colorful pictures of finger positions on a ukulele fretboard. You can play any chord you select with authentic ukulele sound. Play around with different chords, learn their positions on the fretboard and where you need to place your fingers, and then use them to create your own ukulele lessons! 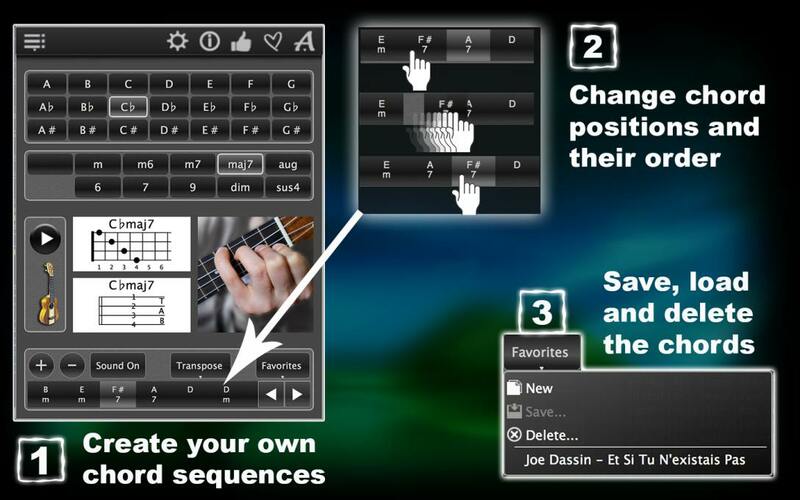 You can also create your own ukulele chord sequences to accompany your favorite songs and save them in the app as Favorites. Create and save as many sequences as you want! Or, delete the ones you don’t want! Change the order of the chords within a sequence! 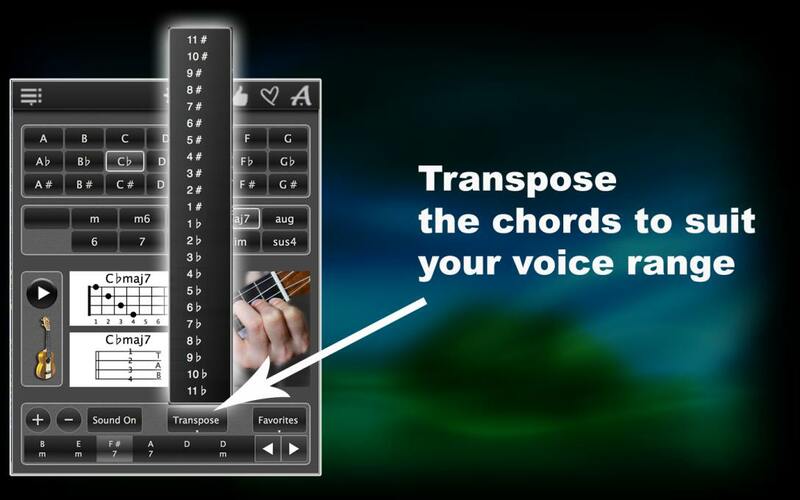 Transpose the chord sequences up or down to accommodate your singing range! Have fun learning how to play ukulele with 120 Ukulele Chords! Download it now! Re: 120 Ukulele Chords. Is there a way to get chords higher on the fingerboard? for this purpose we developed an app “Ukulele Chords Compass” which has the options to change the positions on the fingerboard. I JUST BOUGHT YOUR 120 CHORDS FOR THE UKULELE, AND I AM OVERALL IMPRESSED. I am still a beginner but I am confused by D7 image, where all others I’ve seen are just 2nd fret G & E strings. Can you explain the difference? In the app for D7 chords you can see 2-2-2-3, but for the same chord there are 2 more on the second thread 2-0-2-5 and 5-2-2-0 may be it one of these.